Scientific Name(s): Scutellinia scutellata (L.) Lamb. Photographer(s) Appreciation: Yet another nod of appreciation to Anne Elliott@Flickr, this time for her photograph of Scutellinia scutellata. We're always grateful for your generosity, Anne. 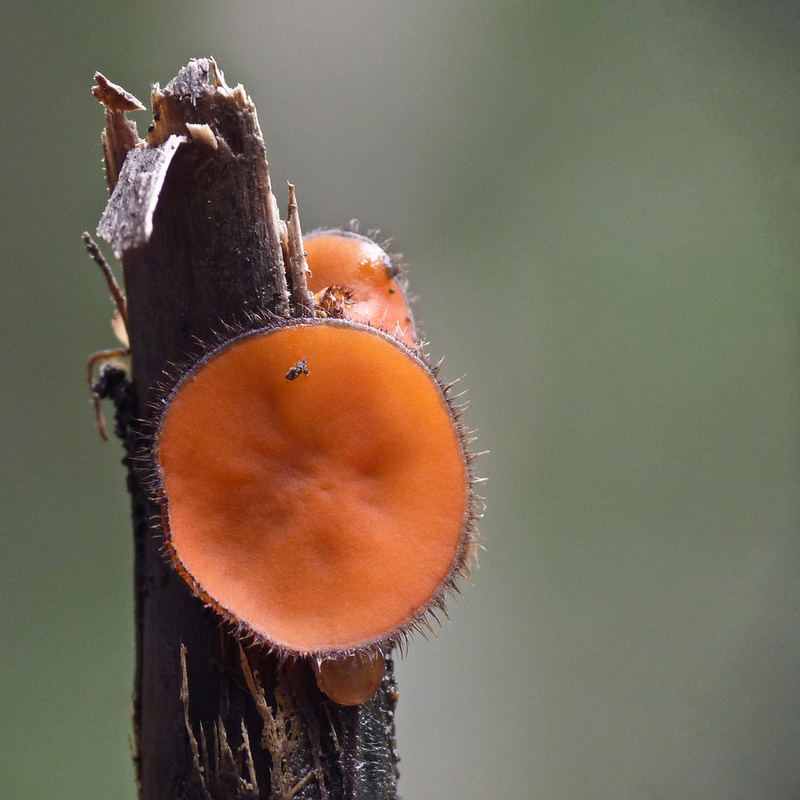 Eyelash pixie cup, eyelash fungus, eyelash cup, scarlet elf cap, Molly eye-winker–all are common names for this diminutive fungus. As noted in the Wikipedia entry on Scutellinia scutellata, this species is common across North America and Europe, and recorded from every continent (yes, even Antarctica). If you have yet to see it, look for bright orange spots on rotting wood and damp soil. I only noticed it for the first time early this summer when it was pointed out to me. So small! I suspect now that I know what to look for, I’ll see it more often. Michael Kuo of MushroomExpert.com had to have his eyes opened to it as well: Scutellinia scutellata. If it reminds you somewhat of a sliced carrot, the pigmentation is due to the same group of pigments found in those root vegetables: carotenoids. Is it edible? Doubtful, and even it is, it’s not worth the effort gathering something that is about the size of the flat end of a pencil eraser. Mykoweb has additional photographs and a scientific description: Scutellinia scutellata. “Eye-winker” is apparently US slang for eyelash, “Molly” is intriguing as it may mean a prostitute, a low-class girl, a gay man before that use of gay was invented or, perhaps, refers to a molly cottontail. The photo and your added trivia have me picturing Malcolm McDowell’s right eye in A Clockwork Orange. From the photo I didn’t realize the size until reading. Interesting. whoa – branching out to the fungi are we? As a mycologist of 40+ years, I saw this species headline and was glad to know the fungi are eligible for your posts. Scutellinia scutellata is an all time favorite! I may be sending you fungi photos sooner than later. So glad you include fungi in your posts. Thanks! Thanks, as always, for a lovely photo of this pretty little fungus. I always enjoy your background info and, especially, the “common names”. It’s such an interesting insight into how people use or make visual associations with the plants. This one’s a little gem. I appreciate the honesty of admitting you only noticed this little mushroom when it was pointed out to you – and now you’re spreading the wisdom. It seem to me there’s another very small orange mushroom that’s not this shape, but for sure I will be looking more closely now. Great photo! Thank you for your diligent efforts, Mr. Mosquin and to everyone else who contributes. Botany has been a lifelong interest and wonder for me and time hasn’t allowed enough for that appetite. Spice of science and truth all at once!